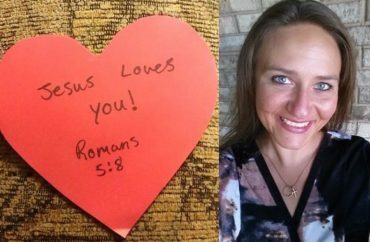 Polly Olsen has handed out “Jesus Loves You” Valentine’s Day cards on the campus of Northeast Wisconsin Technical College for years. But the college’s recent attempts to block her from distributing them prompted her to file a lawsuit alleging that the college is unconstitutionally restricting her First Amendment rights. The 29-year-old Green Bay resident and paralegal student said that, over the years, many people have reacted with pleasure and thanks to her Valentine’s Day cards. Distributing them was a tradition she and her mother had followed since she was young, handing them out at nursing homes and hospitals. But when Olsen began handing out the cards in February of this year, the experience took on a sour note. Olsen told The Fix that she was handing out the Valentine’s Day cards for about 15 minutes before she was stopped by campus security. The officer allegedly informed her that handing out the valentines constituted “soliciting,” although as the lawsuit points out, she was not selling the valentines or asking for anything in return, and recipients were free to refuse them. She was taken to the security office where officials accused her of being a disruptive student, and also told her some people may be offended by a Valentine’s Day card that says “Jesus Loves You,” the suit alleges. A few years ago, Olsen’s Valentine’s Day efforts also drew the ire of campus officials, but at the time they complained about the content of the messages as opposed to where she was distributing them, she told The Fix. The lawsuit argues that as a public university, Northeast Wisconsin Technical College cannot “legally declare the vast majority of campus to be a ‘non-public forum.’” It seeks to have the court declare the college’s public assembly area policy unconstitutional. The college’s statement adds that they sent security after Olsen because she was handing out her cards outside its public assembly area and officers were “responding to a call.” It concludes by explaining that the college is actively reviewing its free speech policy, a process launched in October 2017, and has invited Olsen to participate. The effort will go through a student review and comment period and will be published in mid-October, Karen Smits, vice president for college advancement, told The College Fix in an email. The lawsuit claims she had visited that non-student area many times without being invited and it was never an issue. For her part, Olsen expressed to The Fix that she felt her constitutional rights had been infringed and that she was very stressed by the experience. But she also said she is grateful for the teachers in her program and wants to continue there.